TOKYO--(BUSINESS WIRE)--Renesas Electronics Corporation (TSE: 6723), a premier supplier of advanced semiconductor solutions, today announced the world’s first (Note 1) microcontroller (MCU) with embedded flash that integrates a hardware-based virtualization-assisted function while maintaining the fast, real-time performance of the RH850 products. This hardware-based virtualization assist technology can support up to ASIL D (Note 2) level of functional safety, providing greater levels of system integration. 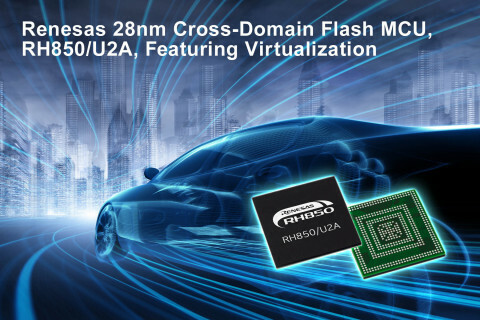 The RH850/U2A MCU is the first member of Renesas’ cross-domain MCUs, a new generation of automotive-control devices, designed to address the growing need to integrate multiple applications into a single chip to realize a unified electronic control units (ECUs) for the evolving electrical-electronic architecture (E/E architecture). The new automotive-control MCU is equipped with up to four 400-megahertz (MHz) CPU cores in a dual core lock-step structure. Each CPU core integrates a hardware-based virtualization-assisted function, while maintaining the same fast real-time performance provided by the RH850. To support ASIL D, the MCU includes self-diagnostic SR-BIST (Standby-Resume BIST) functions with minimized current fluctuation rate. The hardware-based virtualization-assisted function allows multiple software systems with varying ISO26262 functional safety levels to operate independently without interference during high performance. It also reduces the virtualization overhead to maintain real-time execution. This enables users to integrate multiple ECU functions into a single ECU while maintaining safety, security, and real-time operation requirements. The demand continues to grow for MCUs with built-in large capacity flash memory to support over-the-air (OTA) functionality that automatically and wirelessly updates ECU software to control programs without interrupting vehicle operations. The RH850/U2A MCU is equipped with up to 16 megabytes (MB) of built-in flash ROM and 3.6 MB of SRAM, offering users the flexibility for future function expansion. The MCU includes security functions that support Evita Light up through Evita Full (Note 3) for enhanced protection against cyber-attacks, enabling the device to support safe and rapid Full No-Wait OTA software updates as security requirements evolve. The RH850/U2A MCU is also equipped with an extensive set of networking interfaces, including an SGMII-standard 1 Gbps Ethernet communications interface and a CAN-FD interface with up to 16 channels, enabling the MCU to process the large amounts of sensor data being generated by multiple types of sensors in ADAS and autonomous driving functions. This allows customers to support future high-speed network functions and advanced communications throughput requirements.